Regarding motherboard, processor and memory we recommend Intels most recent socket 1155 combined with 2 x 4 GByte of DDR3 memory. Paired up with an Intel Core i7-3770 CPU there is plenty of performance for realtime video streaming, gaming, graphics design or any other application. To allow very smooth working we recommend a quick SSD. The ASUS graphics card comes with a big cooler that offers silent cooling even under load. Furthermore this card also offers good connectivity and the performance level is reasonable for a system like this. 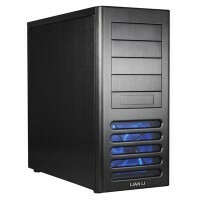 With the Lian Li PC-7FN we recommend a compact ATX case that is very well build, ergonomic and comes with a nice design. There is enough space to put all the components in it. Regarding the power supply we chose a Corsair AX650 Gold. This thing offers 650 Watts and it has been 80 PLUS Gold certified. According to 80plus.org this block comes with an average efficiency of 90 percent which really is excellent and it definitely have a positive impact on your electricity bill. Concerning the display we recommend an HP 22 inch TFT with native FullHD resolution and LED background light. Tanks to the LEDs the display comes with good brightness and it is energy efficient. Furthermore the display comes with an IPS panel, which offers excellent image quality. Mouse and keyboard come from Logitech. In our opinion a high quality mouse pad is needed because it allows a user to use its mouse as precisely as possible. It's not a rare thing that the addition of a good mouspad makes a bigger difference than buying a new mouse. If you should be thinking about buying this entire configuration you'd have to pay CHF 1'986.- (est. EUR 1'655.-). The price is without obligation.